WORLD PREMIERE! What happens when a bunch of tomcats find and are forced to raise a baby seagull? Lives are certainly changed forever, and for the better! This brand-new children's musical is a story about what it means to keep your word once it is given and about promises fulfilled. Through laughter and heart, the production will teach that love and caring can come from the most unexpected places. 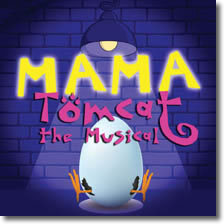 Mama Tomcat - the Musical was written by West Hartford playwright and novelist Spring Hermann and celebrated composer and lyricist Stephen Murray is based on material from Luis Sepulveda's novel The Story of a Seagull and the Cat Who Taught Her How to Fly.